Marcia's Place... it's the best place to eat in Oistins! It's at the southern end (left) of the Oistins Bay Garden. You can eat the freshest fish from the fish market next door. Marlin, Dolphin (the fish not the mammal), Flying Fish and Snapper. There's chicken for those who prefer it. Enjoy a Rum Punch or a Banks beer in lively surroundings. 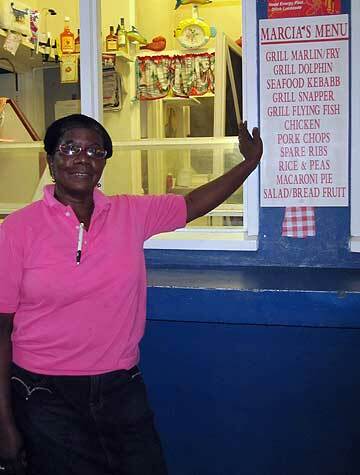 The famous Friday Night Fish Fry is the busiest evening with music, but every night is worth a visit to Marcia's Place. A truly Bajan experience not to be missed.